Gabrielle Vanity Tri-Fold Mirror by Magnussen Furniture at The Malaysian Mirror. MPN: Y2194-47. Hurry! Limited time offer. Offer valid only while supplies last. Y2194-47 Features: -Comes with hardware to attach to desk. -Mirror bevel: 1''. -Hardwood solids and fabric construction. -Snow White finish. Y2194-47 Features: -Comes with hardware to attach to desk. -Mirror bevel: 1". -Hardwood solids and fabric construction. -Snow White finish. -Gabrielle collection. Product Type: -Vanity Mirror. Style: -Traditional. Life Stage: -Kids/Teen. Finish: -White. Primary Material: -Wood. Drawers Included: -Yes. Mirror Included: -Yes. Dimensions: -37" H x 48" W x 9" D, 58 lbs. Overall Height - Top to Bottom: -37". Overall Width - Side to Side: -48". Overall Depth - Front to Back: -9". Overall Product Weight: -58 lbs. If you have any questions about this product by Magnussen Furniture, contact us by completing and submitting the form below. If you are looking for a specif part number, please include it with your message. 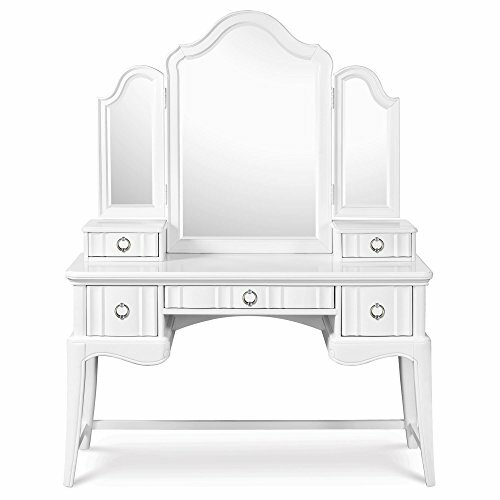 Kidkraft Princess 12.75" Pink Mirrored Vanity Table with Drawer and Bonus Stool Set for Your Children to Enjoy! This Princess Kids Diva Table and Stool Gives Every Little Princess the Perfect Place to Prepare for Each Day.